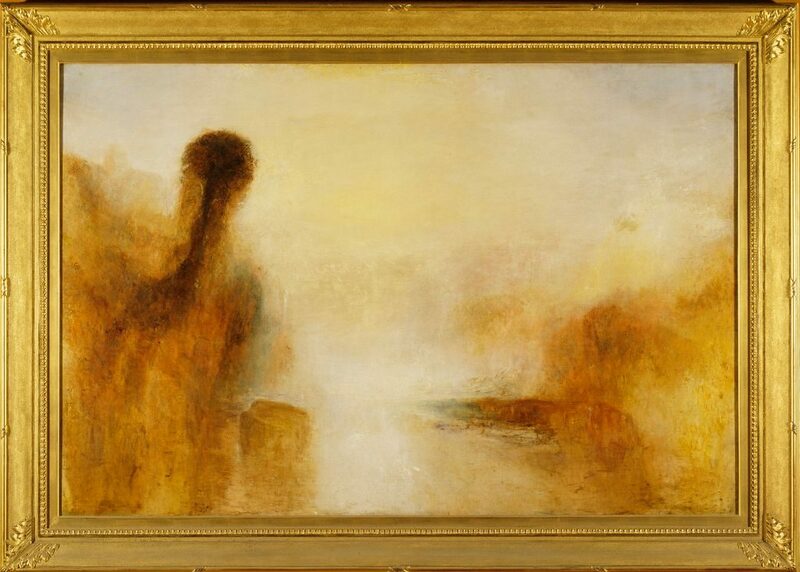 For over a hundred years now the paintings of William Turner have been inextricably linked to those of Claude Gellée. 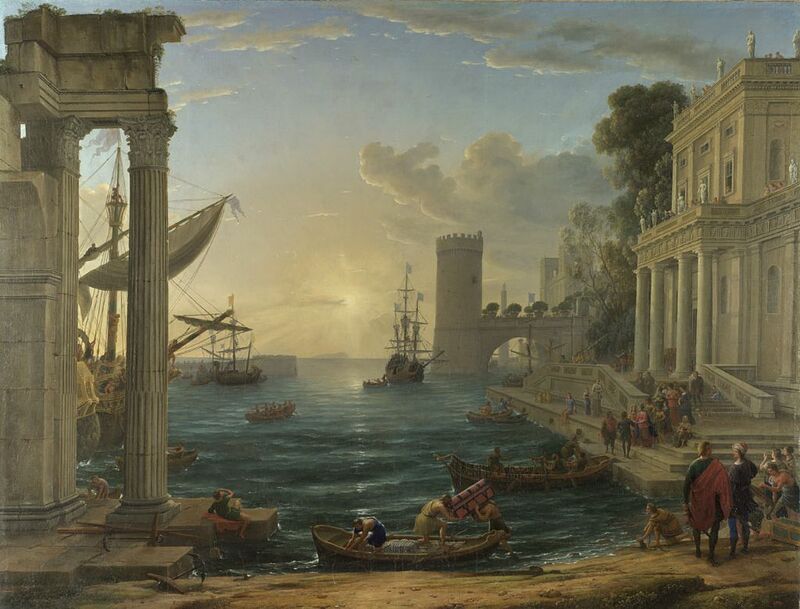 Not only was Turner inspired by the landscapes of Claude, but is reputed to have burst into tears on his first viewing of Claude’s Seaport with the Embarkation of the Queen of Sheba, 1648. 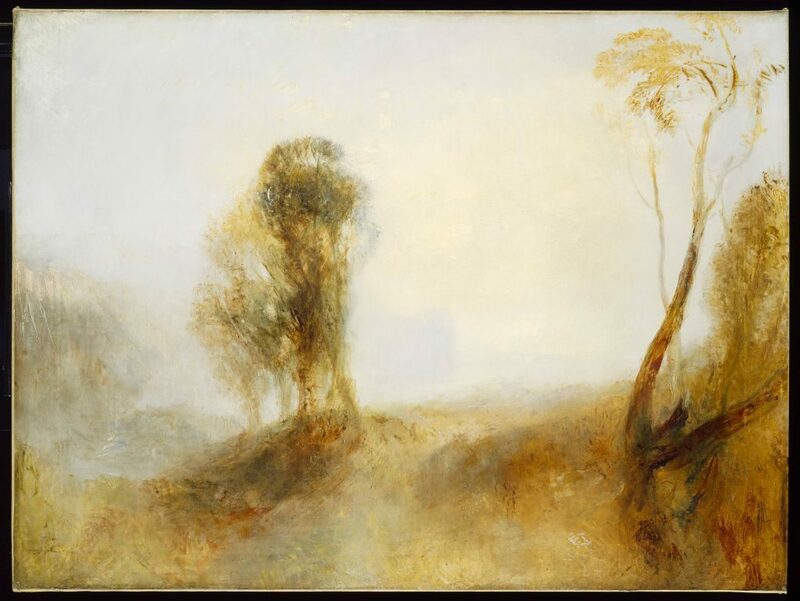 Something within that painting resonated so strongly with Turner that he embarked on a number of slavish copies of Claude’s paintings, sometimes copied from memory, sometimes by revisiting the original site of Claude’s work. Though his later works would drift away from the utopian landscapes of Claude, Turner determined that he should be linked to Claude, and in his will left two of his paintings to the National Gallery with the strict proviso that they be hung together with the Claude Embarkation and Landscape with the Marriage of Isaac and Rebecca. Additionally these paintings were to be hung in a newly constructed room to be named the Turner Gallery. In an attempt to tease out the detail of the Turner Bequest, and to demonstrate more completely the relationship between the two styles of painting, this exhibition brings together a number of additional work and a substantial collection of items relating to the Bequest. In reality the latter tend to be overshadowed by the paintings. At first glance the show is somewhat problematic and unsatisfying. The Claude examples are for me much more beautiful than the Turner’s, but this is because I personally prefer the aesthetic of earlier painters, being much more firmly rooted in Renaissance art. Neither does the staging alongside so many of Claude’s paintings allow me to leap forward to Impressionism, not matter how much Turner prefigured that style. To gain the most from the exhibition I think you need to leave Claude to one side – treat them as a separate section of the show, and instead concentrate on the later Turner paintings. Here, where he has moved away from his slavish copying of the earlier Claude landscapes we see a much more complete sense of who Turner has become. It is in these representations of his own era that Turner excels. For me by far the most beautiful Turner in the show is the Keelman Heaving the Coals by Night, 1835 which is very firmly rooted in his present. The industrial smog, the burning fires, the crowded port, all speak of a much more contemporary world – a world in which Claude’s mythical figures simply cannot exist. 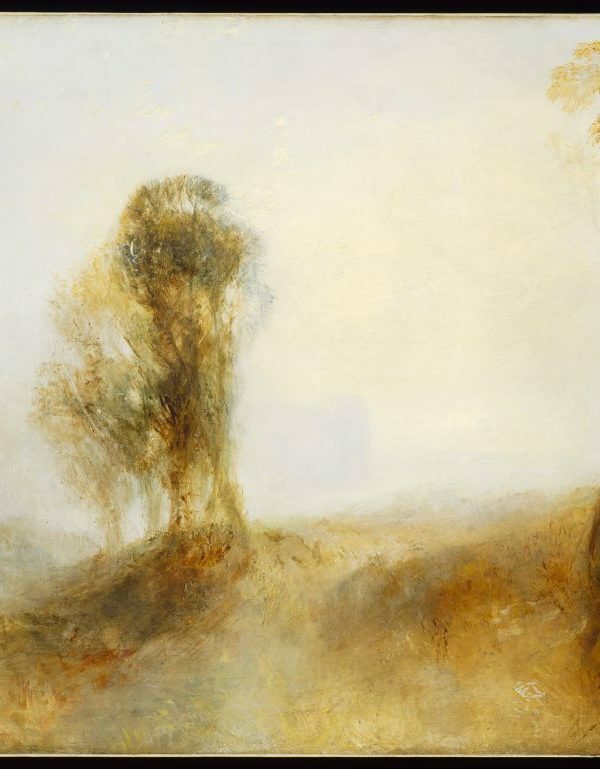 Here Turner is able to deliver what he has learnt from Claude and his other heroes – a fully realised view of his own era. No mythical state, no mythical characters, but an ethereal echo of those landscapes brought fully up-to-date. Also in the show are Turner’s watercolours from the 1840’s. These are haunting, mesmerising, instantly recognisable and yet somehow intangible. In a few of his later oil paintings Turner adopts this very fluid style to great effect, conveying more mood than landscape. However there is sense of fading in these later works, and they do not stand up well to the huge, imposing and majestic Claudes. Comparisons are rather crudely made, and on the whole Charlotte and I found the Turners very unsatisfying. This staging does them a disservice – the elements relating to the Turner Bequest are somehow lost amongst the paintings. Had Turner realised what was to come later, by way of Impressionism, he may have been more content to allow his paintings to hang in their own right, but at a time when half of the private collections in England contained at least one Claude, he may had believed this was the only way for him to gain the recognition he felt he deserved. Perhaps further comparisons might have been made more successfully – in the last decade Turner’s work has appeared in a number of difficult groupings. In 2005 we had the Turner Whistler Monet exhibition at Tate Britain, where I felt the Turner’s were left lacking in comparison to Monet. In 2009 Turner appeared in two separate exhibitions. In Turner and the Masters at Tate Britain he was hung with Claude, Poussin, and Titian. and at Tate Modern he was hung with Rothko, having greatly influenced the latter. The problem with each of these exhibitions is that Turner never entirely lives up to the comparison. Monet and Rothko are so bright and vibrant that the Turners seem washed out – as they do against the Claude’s in this exhibition. When hung with others I find my eye is constantly drawn away from his paintings towards something more definite, certainly with more colour. 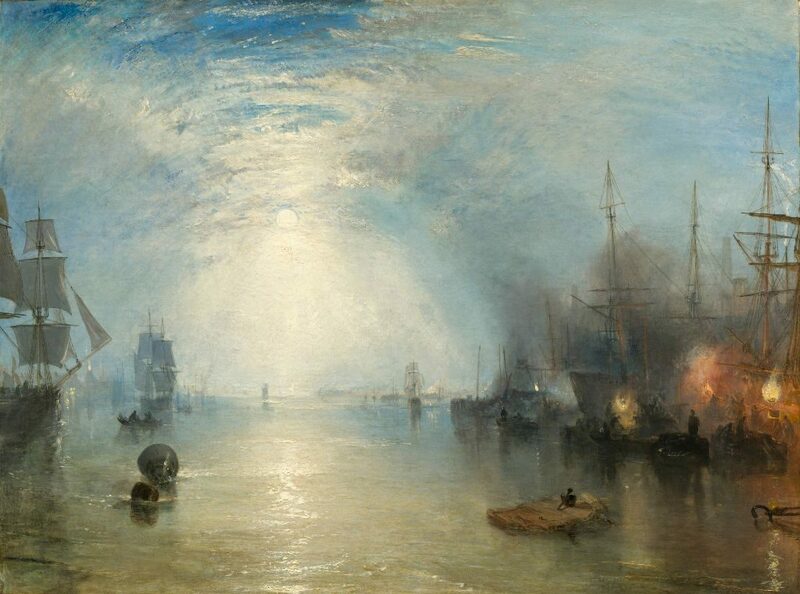 Turner would do much better by comparison were his works to be shown on their own. One’s eye would be able to adjust to the limited palette, the veiled images, and to gradually absorb the aesthetic – they deserve the opportunity to stand on their own.